Edition Etching Rag is a 100% cotton fine art paper with a smooth texture, reminiscent of the original genuine etching and printmaking papers. The paper has the purest white tone available on the market, without Optical Brightening Agents (OBAs). Edition Etching Rag offers a high paper shade stability and a resistance to ageing by using natural minerals. 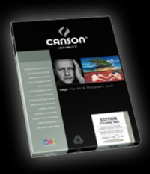 This museum-grade paper provides deep blacks, excellent image sharpness and optimum colour graduation. It is ideal for printing detailed work either in colour or black and white.